It's in County Armagh, Northern Ireland, pretty much due south of Lough Neagh. That's that great big lake in the middle of Northern Ireland, if you're a little geographically challenged about that part of the world. 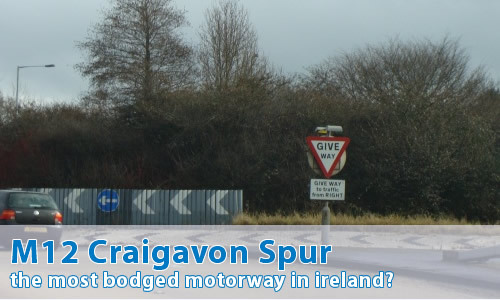 The M12 is a tiny spur from the M1, meant to provide access from the motorway network to the New Town of Craigavon. Things didn't quite go as smoothly as they might have expected though. Well, we'll start at the southern end. The motorway itself starts in a really stupid place, which shows that this isn't the place it's meant to begin - halfway underneath the roundabout at junction 2. Whilst that may not seem like much of a problem, bear in mind that non-motorway traffic is allowed all the way up to the "chopsticks" signpost, by which time it's 400 yards too late. There's no escape, and drivers of banned vehicles just have to stop dead, right in the way. And sit there. Forever. Yes, that's right, it's Northern Ireland's only single carriageway motorway. For a couple of hundred yards, anyway. It's a little odd - unlike most of the single carriageway motorways in Great Britain, there is a double white line in the centre, meaning that overtaking is banned. That's not particularly odd-looking, but the fact that there's hard shoulders on both sides certainly is. It does at least allow all those cyclists to take their lives even more in their own hands and U-turn across the carriageway rather than living out the rest of their lives camping at the side of the road. The single carriageway sections runs along what should have been the northbound carriageway of the motorway, with bridges all set up for the non-existent southbound carriageway, but instead passing over some scrubland. The motorway then opens out into a regular two lanes per direction, plus a hard shoulder. For just under a mile, anyway. When the M12 first opened, only the sliproads in the direction of Belfast connected it to the M1. In a mad fit of being remarkably sensible, the engineers in charge knew that at a later date there would be Dungannon-bound slip roads too, so they built in a nice bridge ready for that heady day when the M12 and M1 would be connected by a posh triangular junction with lots of swoopy sliproads, just like, say, Ray Hall, the M6/M5 junction in Great Britain northwest of Birmingham. Great stuff so far, right? In 1992, the junction was finally completed, and traffic could happily go between Dungannon and the M12, and that nice bridge that was built 25 years earlier finally saw cars on its top side. The rest of the slip roads were built, and all was well. But with one minor, eeny meeny little difference that's barely worth mentioning. Why do I get the feeling that you're building up to something? Anyway, it seems that those nice Ulster Bank notes ran out. Maybe there was an overspend on sandwiches and cakes, or maybe someone accidentally put a decimal place in the wrong place, and there wasn't quite enough money to finish the junction as planned. So, to save money, let's not bother with building the other bridge that's needed. No, instead, we'll save a few quid by bunging in, yes, you've guessed it, a roundabout. Not any old roundabout either, but one roughly the size of a dinner plate. In the middle of the motorway. Yes, the middle - the sliproads in the Belfast direction are still technically part of the M12 mainline, whilst the sliproads in the Dungannon direction are just that, sliproads. Yes, it's completely ridiculous. It looks stupid, and I don't like it one bit. I don't care that it's functionally exactly the same as starting any old motorway with a roundabout above or below the other motorway, there's all these great big long sliproads and large expensive bridges, and then there's this really, really, really tat roundabout linking it all together. I'm not finished yet, though. What the heck else is there? Well, I don't know whether they managed to find a few pence down the back of a settee, or whether it was a case of "right-ho lads, we've got this money and we MUST spend it" but the roundabout has a little special thing around the edges. Now, let's take this slowly. It's a teeny, tiny roundabout that's under motorway regulations. There are blue signs everywhere, and generally there's no way to get at it other than from a motorway. So, what's the most pointless waste of time and money that you can possibly think of? I dunno, I can think of quite a lot. OK, I'll put you out of your misery. There's a footpath. All the way around. Yes, that's right, on land where pedestrians are banned, there's a footpath. My head is in my hands. Let me see those photos!